Howard W. Campbell, Jr. writes his memoirs while awaiting trial in Israel for the war crimes he committed during the Second World War as a big time Nazi propagandist. In fact, Howard was an agent for the United States, ciphering his racist broadcasts with important messages for The Free World. The year is 1961. Nobody believes the story of how he-- an American born, German reared playwright-- was recruited by an agent called Frank Writanen to get messages out of Berlin. Writanen doesn't come forward and the only other person who knew what Howard was up to was the man he had referred to in his broadcasts as Franklin Delano Rosenfeld. Howard writes about his life in Germany before his involvement, of his marriage to the daughter of a Police Chief, of the romantic plays he wrote as an apolitical young idealist who thought of the Nazis: "They were people," of Adolph Eichmann whom he meets in Jail, of a broad spectrum of contemporary American racist groups. "All people are insane," he concludes. "They will do anything at any time, and God help anybody who looks for reason." Howard finally finds himself guilty. The crime? Merely being part of the world as it was and is... This is a gothic melange of stygian ideologies in a world whose only spiritual search is for pure evil. 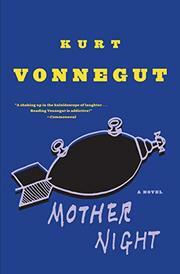 An early work of Vonnegut's, he has since improved. It appeared as a Gold Medal Paperback in 1961.